Disney's DuckTales is another one of those weekday afternoon cartoons that I used to watch after school, and I have to say it's really great they Disney is actually releasing them all on DVD. Although my favorite of these Disney cartoons was and still is Darkwing Duck, DuckTales still comes in at my number two spot. The show features the character of Scrooge McDuck, who is owner of McDuck Industries, and thus an extremely wealthy businessman (or businessduck). Unlike the Scrooge that you may remember from Mickey's A Christmas Carol (who was actually named Ebenezer Scrooge), this duck is not mean-spirited by any means. Scrooge has many fantastic adventures in this series, which often consist of him going out on some treasure hunt. His nephews, Huey, Dewey, and Louie often find someway to get involved, if they're not outright invited on the expedition. Sometimes they can get into some trouble, but sometimes they also help get Scrooge out of trouble, which is a balance I really like seeing. Also along for many of the journeys is Scrooge's pilot and pal, Launchpad McQuack (whom you may also know from Darkwing Duck). Of course, there are many, many more characters involved in the series, but it'd take way to long to list them all, and even then just listing them wouldn't do them justice. Each has their own unique personalities, even the "twins" Huey, Dewey, and Louie have their own specialties going on. As the back of the DVD box says, "this hilarious collection finds them on a journey to an African jungle, stowed away on a secret aircraft carrier, and rocketing into space to search for a lost "Money Bin", but this leaves out so many of the stores, such as traveling into the future, experiencing their own disaster movie, and flying through the center of the world. This box set consists of three disc, each self contained in it's own slimline plastic DVD jewel case, and then the three jewel cases slide into box. I prefer this type of packaging rather than the foldout cases, as they're easier to access, don't take up unnecessary space, and feel more durable. Thankfully, this seems to be Disney's standard way of packaging the multi-disc DVD sets. 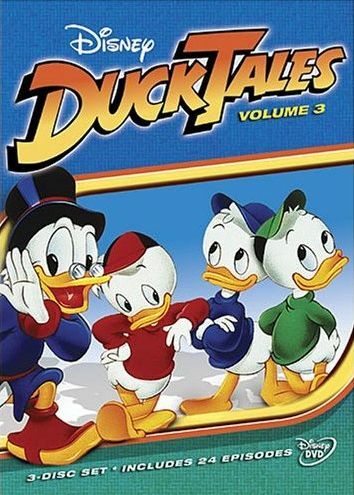 Join the richest duck in the world for another round of hilarious adventures when Disney DuckTales: Volume 3 comes to DVD on November 13, 2007 from Walt Disney Studios Home Entertainment. The three-disc DVD set is a freewheeling collection of favorite episodes from the animated series that is sure to delight audiences of all ages! In these zany adventures, Scrooge McDuck and his rambunctious nephews Huey, Dewey and Louie go on safari in deepest Africa, stow away on a secret aircraft carrier and rocket into space in search of Scrooge’s lost “Money Bin.” Whether they are resisting the charms of Magica DeSpell as she tries to pry the Number One Dime out of Scrooge’s coffers, eluding the nefarious schemes of the Beagle Boys or just trying to stay ahead of Scrooge’s arch rival Flintheart Glomgold, the McDuck clan always comes out on top because they know that friends and family are the most valuable treasure there is! A combination of classic Disney personalities and all-new characters, Disney Ducktales has been delighting parents, children and collectors with its lavishly rendered animation and spellbinding adventures since its introduction in 1987. The three disc set, available just in time for the holidays, is a perfect introduction to the charming series and a sparkling addition to any collection.